As anyone shopping in Dubai mall knows - the hours of walking around can really build up an appetite, and Cafe Blanc for me and my sister proved to be a perfect restaurant to fill our hunger needs! We entered the restaurant at around 8pm, deciding where to sit was a bit of a task since they have 3 seating areas, the area in front - mall facing, the middle section - closed doors and an outside area for the sheesha, which even in the summer was packed since they have cooling fans kept outside. Since we only came for dinner we opted to sit in the middle area. 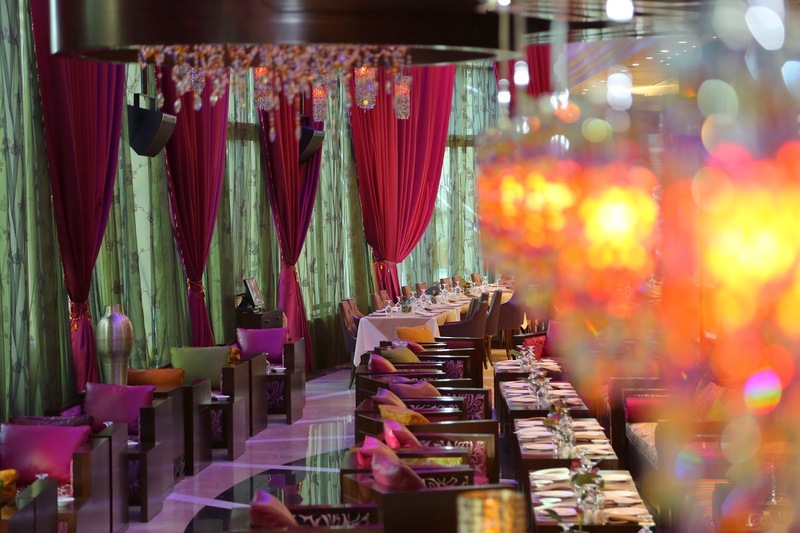 One thing very noticeable on entering is the attention to detail in all things Lebanese, the beautiful olive vases, the night sky like ceiling, the colourful sofa's all imported from Lebanon. The restaurant's ambiance is such that you could enjoy a lovely dinner date or even a fun evening with friends here. We were welcomed by Christopher, the floor incharge and went straight into the drinks and starters. Christopher recommended the Andalousia and although I thought it was too simple I decided to give it a try. I was amazed. The simplicity of this drink almost made me leave the drink I ordered! The Andalousia is a must-have, the cold ice-cream mixed with the bananna's and the blackberry syrup which holds it all together - Perfect. Another favourite was also the Hanayen, these drinks are perfect esp if you opt to sit outside. For the starters, we ordered the Rocca feta salad, they also have the option of rocca-zaatar and rocca halloumi, shankleesh, jweneh bil kouzbara, sojok and ras asfour. The salad wasn't over-empowered with dressing instead the fresh produce spoke for itself! The perfectly ripe tomatoes and rocca leaves mixed with the saltiness of the feta cheese an overall perfect combo! The shankleesh if you haven't eaten it before is a mix of fine shankleesh cheese mixed with finely sliced onions, tomatoes and parsley. Before eating it, drizzle some olive oil over it and voila! This completely won my sister over! The jweneh bil kouzbara is chicken wings mixed with red pepper and coriander, and this was one of our favourite dishes since the chicken was cooked perfectly however the lemon flavour was a bit excess. The chicken however was a 5 on 5 since it was cooked well and the packed in quite a bit of flavour. The absolute winner for us however was the Sojok, pan-fried spicy sausage topped with diced tomato, pickles and bell peppers. Had this been served in a large bowl it could have been our main course! Kudos to the chef who did not over-empower the taste of the spicy sausage but just added enough veggies and sauce to compliment it. The ras asfour was a simple dish yet the flavour was impeccable, the beef diced and mixed with soya and lemon and sauteed onions was all a match made in food-heaven! The beef was tender and was allowed to rest in this thin gravy which really allowed the flavour to seep in. For the mains, we decided to get an oriental club sandwhich which is the best vegetarian sandwhich I've had! The layers of grilled zucchini and egg plant, fresh cream cheese served on a grilled bread with cheese. Not only was it tasty but it was a healthier option too. Another option for the main would also be a chicken wrap, it's the perfect lunch option, light on the wallet and the tummy! You can also opt to change your side dish, instead of fries you can opt for the potato wedges, rice, steamed veggies or even a salad. It really is a menu that suits your requirements this can also be done for the mains like the mixed platter. The mixed platter is served with hommus, garlic paste, rice or potato wedges. The juicy and tender meats really fill you up and its definitely a portion to be shared by two! For the desserts, we opted for the byzance and the lebanese night. Both dessert were a 10 on 10 leaving us only wanting more. The byzance is a soft, light cheesecake topped off with rose Turkish delight. The lebanese delight was something different that we hadn't tasted before - its a semolina cake filled with lebanese cream (ashta) and bannana's and cashews. There is also a sweet syrup on the side but the taste of the dessert on its own is sweet enough! Since we couldnt eat another bite, we ended our meal with the famous cafe blanc - hot water and orange blossom essence which helps with the digestion. To go we took a cafe latte and a hot chocolate, both which were really the prefect way to end our meal and find our car in the huge parking lot of Dubai mall! Overall, Cafe blanc is the best place to get an authentic feel for Lebanese food and atmosphere!